Time to ring out 2010, and recap all the angry discussions Mike and Mike started this year! E-books, digital self-publishing, consumer gagdets for e-readers and beyond, and much much more... and never fear, we're sure they're likely to continue instigating into 2011 and beyond. 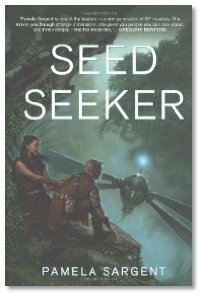 Interview: This week, Mike, Mike and Summer talk with Pamela Sargent about her latest YA novel, Seed Seeker, the concluding volume of her Seed Trilogy (Earthseed in 1983, Farseed in 2007). She talks about how the continuing stories came about after such a long time away from the characters, how each book in the trilogy can be read as a standalone, how she likes to write in a variety of genres, and the options she's considering for a story that's not quite so easy to define for marketing.